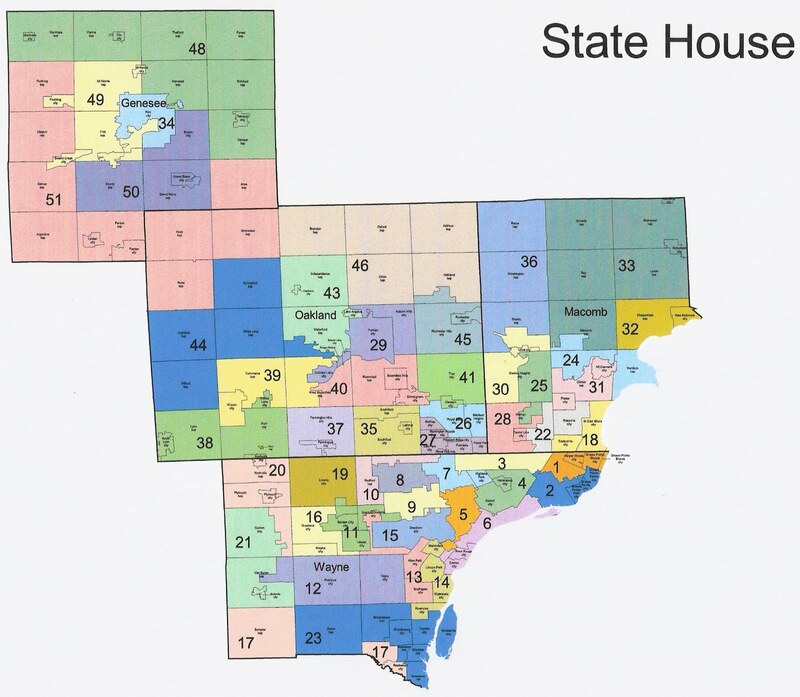 Democrats are hoping to take back the state house. They will benefit from higher turnout in a presidential year and possibly coattails from the presidential race. They will try to take advantage of Republican support for a tax increase for roads and Governor Snyder’s handling of the Flint water crisis, though state house candidates had nothing to do with the latter. There are also many Republican seats first won in 2010 that are now term-limited. Democrats are targeting several Republican incumbents, including 62, 71, 91, and a number of open seats. Brian Banks won the 2012 primary before his long criminal record and ethical issues were exposed. He won a 2014 primary against divided opposition. This year, he again won the primary over divided opposition, and also faces new felony charges. This seat is open after Julie Plawecki’s sudden death. Party insiders picked Inkster Councilman Jewell Jones for the full term. Republican Joseph Bellino has raised a decent amount of money, but running against a two-term incumbent in this environment is too high a hill to climb. He can be a strong candidate when the seat is open in 2018. Pastor Jeff Noble won an upset in the R primary with Tea Party support. He faces D Colleen Pobur in this somewhat moderate district. Pat Somerville won three close victories in this seat, which is the top D target. R Trenton Councilman Bob Howey has fundraised well. He faces Parks commissioner Darin Calmilleri, who won a tough D primary. R Macomb County Commissioner Steve Marino was embarrassed by recordings of him making false claims about his lobbying. He faces D Dana Camphous-Peterson, who has fundraised well. Diana Farrington, wife of the incumbent, won an unexpectedly close R primary. She faces D Michael Notte, son of the former Mayor of Sterling Heights. MIRS rates this district most likely to flip. School board treasurer Pamela Hornberger won the R primary in the seat. City councilman Jeff Yaroch won the R primary in this seat. Kesto has a large cash advantage over D Michael Stack, but the district is closely divided. D Cyndi Peltonen hasn’t raised much money, but Howrylak had a close call in 2012. Bradford Jacobsen narrowly beat back a primary challenge 54-46 from John Reilly in 2014. This time, Reilly (AC) beat Joe Kent (E) by 31 votes. 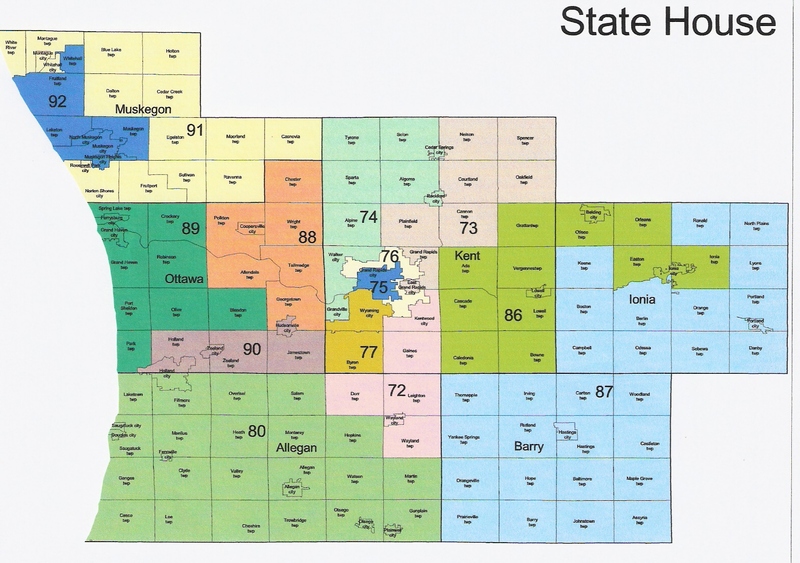 This seat is open since Driskell, who beat an incumbent R in 2012, is running for Congress. School board treasurer Donna Lasinski, who had chamber of commerce support, won the D primary. Jason Sheppard narrowly beat Tom Redmond in 2014 and faces a rematch in 2016. Senior center director Bronna Khale easily won the R primary. She faces D Harvey Schmidt. Iden, who hurt himself by lying about a DUI in 2014, has been attacked for his support of Trump (he was a national delegate) but got good PR for his mass shooting alert bill. He faces a rematch with liberal pastor John Fisher. Dr. Bizon has a large base and great fundraising. He faces D Calhoun County Commissioner Jim Haadsma in the most D house district held by an R.
Jackson County Commissioner Julie Alexander won the R primary. She faces D Ron Brooks, who has not raised much. Van Buren County Commissioner Beth Griffin easily won the R primary. She faces D school board member Annie Brown, who lost to Nesbitt in 2014. Former county commissioner James Lower won the R primary. Tom Barrett beat dem state rep. Theresa Abed in 2014. She is back for a rematch in 2016. Unemployed 25-year-old military veteran Steven Johnson won a shocking upset in the R primary. Republican Casey O’Neill has fundraised well, but running against a two-term incumbent in this environment is too high a hill to climb. Rs will have a better chance when the seat is open in 2018. Restaurant owner Tommy Brann won the R primary overwhelmingly. Teacher Kim LaSata, wife of former rep (1998-2004) Charles LaSata, won the R primary. Mary Whiteford won a special election in March 2016 to replace expelled rep. Cindy Gamrat. Conservative activist Shane Hernandez won the R primary. Owosso Mayor Ben Frederick fundraised well and easily won the R primary. He faces D Anthony Karhoff, who has not fundraised well. Marine Thomas Albert won the close R primary. Ionia County Commissioner Julie Calley, wife of LG Brian Calley, was unopposed in the R primary. Banker Jim Lilly easily won the R primary. Holly Hughes defeated dem state rep. Colleen LaMonte in 2014, who defeated her in 2012. LaMonte is back for a rematch in 2016. Former county commissioner Brian Elder, who is pro-life, won the D primary. Veteran Jason Wentworth won the R primary easily. Township Trustee Roger Hauck easily won the R primary, but has struggled in fundraising. D Bryan Mielke is running again after coming close in 2014 against Speaker Cotter. Accountant/businessman Scott VanSingel easily won the R primary. Mason county commissioner Curt VanderWall easily won the R primary. He faces D former state rep Dan Scripps (2008-2010). Manton Mayor Michelle Hoitenga won a close R primary. Daire Rendon, wife of the incumbent, easily won the R primary. She faces D Jordan Stancil. Inman, who won the Republican primary in 2014 with 21%, beat back a primary challenge this time. He faces D Betsy Coffia. Cheboygan County Commissioner Sue Allor won the R primary. She faces Robert Kennedy, who upset the preferred D candidate. A MIRS poll has Kennedy leading. Beau LaFave won the R primary. He faces Sheriff Scott Celello, won is highly touted by dems, but underperformed in the D primary. "..(Democrats) will try to take advantage of Republican support for...Governor Snyder’s handling of the Flint water crisis, though state house candidates had nothing to do with the latter..."
The biggest myth perpetuated since Snyder 'came clean' this year is that NOBODY in MiGOP politics knew absolutely ANYTHING in regards to what was happening in Flint "until" the Nerd told both them AND the rest of the world. The other group playing stupid for all that time were the very people 'promising' to transform that very party (tea party types/delegates) who refused to push the (shameful) Flint issue HARD or MiGOP involvement IN IT immediately afterwards. TPers (nationwide) pulled the exact same "we know nothing" crap on their donors when the IRS was hot after those generous enough to support them while their Republican 'handlers' insisted that they keep their mouths shut for "timing" purposes many months later. Please do not rewrite history this side of the most important election in our children's lives. 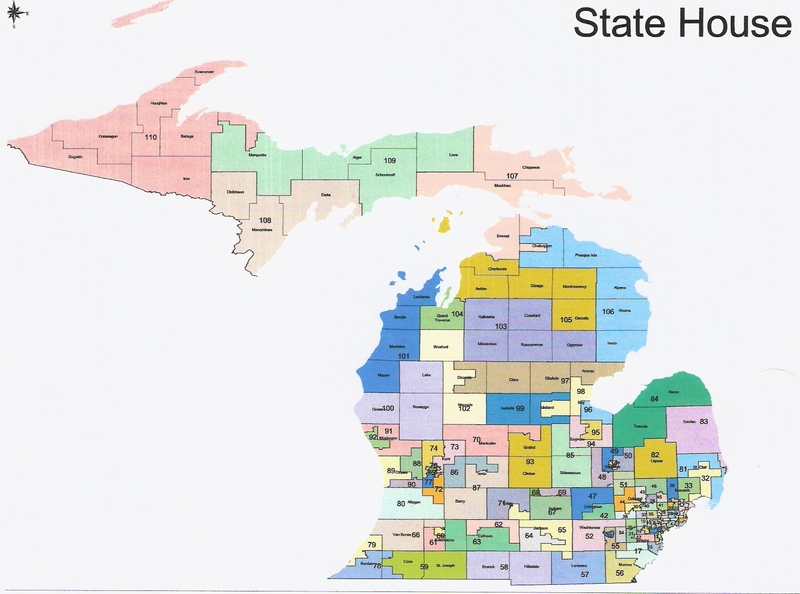 We have enough problems forcing older Michiganders with pensions to admit that the locally wealthy are falsely propping up bond ratings to raise taxes on their kids and send them all riding off in to the sunset clutching both our children's treasure and future. ...when Trump's main man here in Michigan (with the MiGOP's blessing) purposely orchestrated the exact same crap (sorry, but I was there) using 'celebrities' (and not) but 4 years ago in Lansing on 3 separate occasions during Right To Work? Over $30,000 raised in but a few hours by Michigan Republicans for a "random victim" hot dog vendor (set up in a tent which we were all told to stay out of earlier) who dominated MiGOP talking points immediately afterwards. Let's all keep covering for Michigan Republicans just as much as possible ahead of the very same (again historic) election 4 years later.